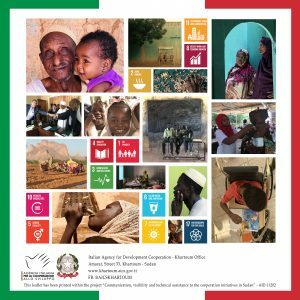 Sudan is a priority country for the Italian Cooperation as indicated in the latest triennial action plan 2017-2019 and is a strategic country also for Europe because it is a point of transit of migration flows from the Horn of Africa. The Agency works in Sudan without a Cooperation Framework Agreement. The Italian Cooperation cannot dispose of financial instruments in Sudan such as aid credit and budget support, therefore, the only available financial channels are bilateral in direct management, multilateral and contributions to Italian Universities and Italian NGOs. The initiatives currently underway amount to around 71 million Euros. The main objectives for AICS are to fight poverty and to improve the social and health conditions of the population. Among the cross-cutting sectors particular attention is given to social inclusion and gender aspects such as women's empowerment. From 2016, more consideration has been given to the increasing migration flows that transit through Sudan; it should be noted that only in 2017, with the escalation of the conflict in South Sudan, Sudan has received about 450,000 South Sudanese in the States of Darfur, South Kordofan and Khartoum. The areas of historical concentration of our cooperation are in States of the Red Sea, Kassala and Gedaref. With the initiatives approved in 2016 and more so in 2017, Khartoum, El Gezira and Blue Nile have become, though to a lesser extent, part of the geographic priorities of our cooperation.